In medium bowl, stir together all dressing ingredients except cheese; gently fold in cheese. (Dressing may be made 2 days ahead. Cover and refrigerate). Portion 1/2 cup lettuce onto each of 6 individual salad plates. 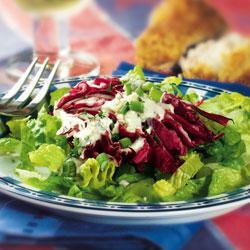 Cut radicchio into 6 wedges, place wedges on lettuce beds. Ladle generous portions of dressing over each salad, garnish with scallion and parsley. This entry was posted in radicchio, salad, superfood by admin.royalrose. Bookmark the permalink.